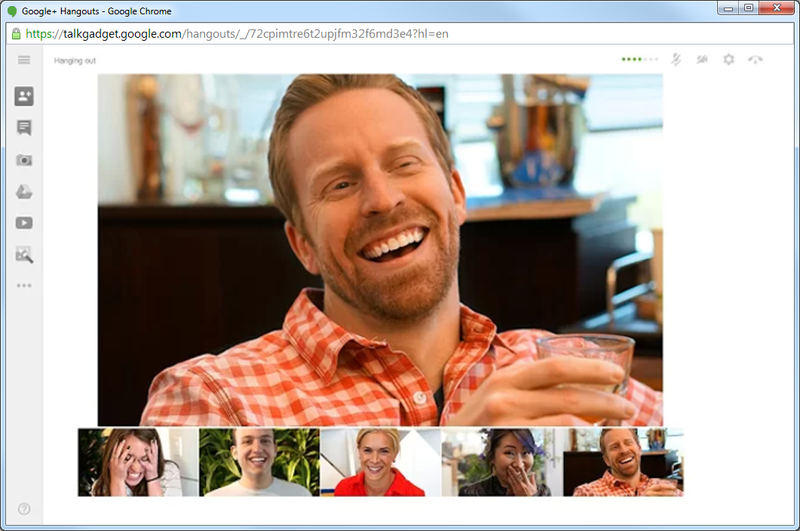 Google+ Hangouts allow you to have group voice and video conversations with up to 10 people at once across different devices and across the world. We’ve been working closely with Google to combine the power of Google+ Hangouts with Insightly, and we’re excited to announce that today we’re launching integrated Google+ Hangouts right inside Insightly. Let’s say you want to bring together several of your contacts to discuss an upcoming feature of your product currently in development. Select those contacts you want to speak with in Insightly, and in just two clicks invite them to connect and join a video or voice Hangout with you. 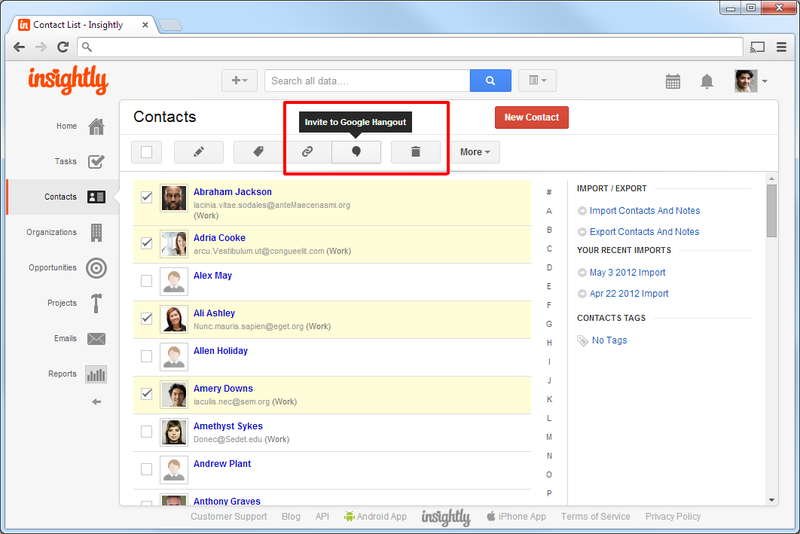 Insightly can even create a Hangout between you and a contact by calling their phone number directly inside Insightly. 1. 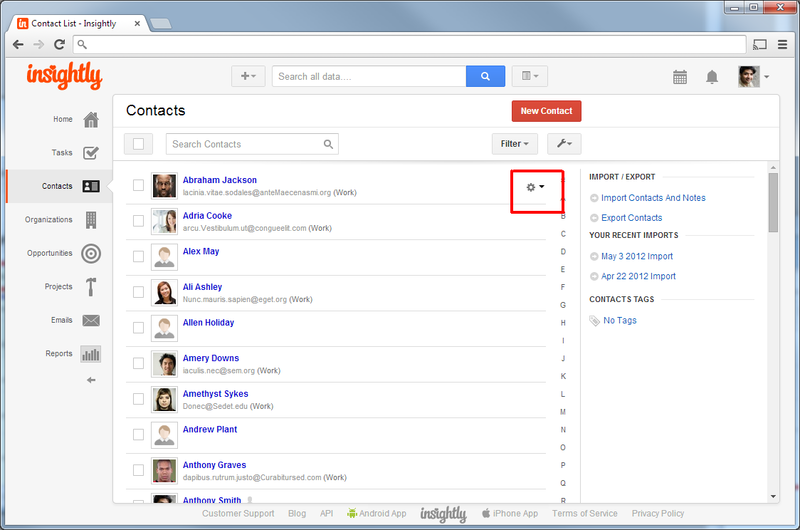 First select up to 10 contacts from the contact list and click the new Hangouts button that appears in the header. 2. Insightly will open a popup listing the contacts you have selected, and all you need to do is click on the green ‘Start a Hangout’ button to invite those users to join you in a new Hangout. If you have selected one contact Insightly will give you the option to call that contacts phone number and join the two of you in a new Hangout. 3. After you have clicked the ‘Start a Hangout’ button, a new Hangout window will open with all the selected users ready for you to invite to join your new Hangout. 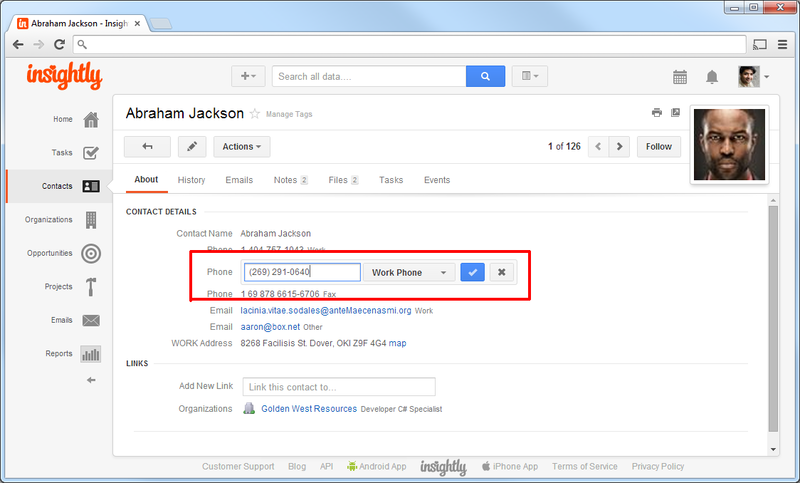 If you have chosen one contact with a phone number, the new Hangout window will give you the option to call that user immediately on their listed phone number to join your Hangout. 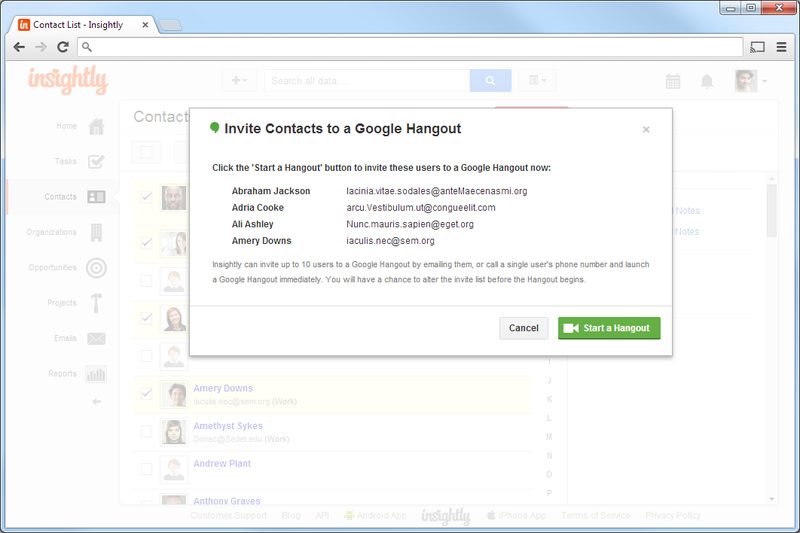 Google+ Hangouts are free, and the ability to select and invite contacts to join you in a video call or conference right from within Insightly is a very powerful feature. 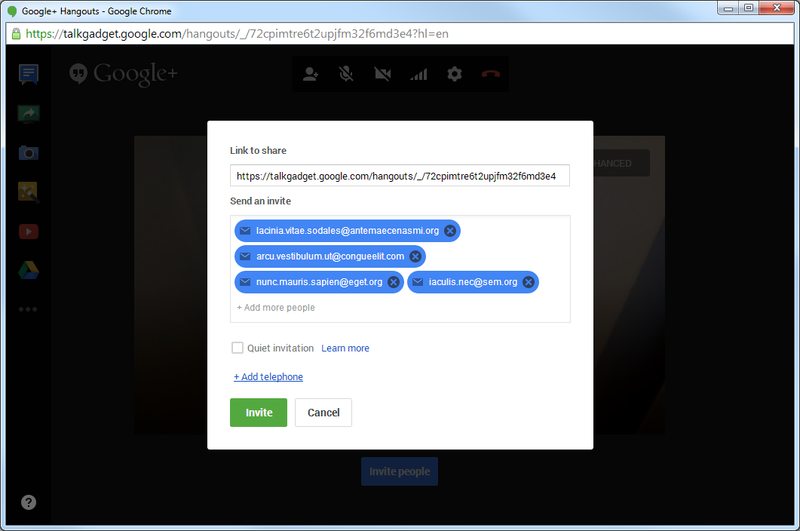 Hangouts also allows you to share your screen with other participants, capture and keep still photos from the call, and share your files with other participants through an integrated Google Drive interface. 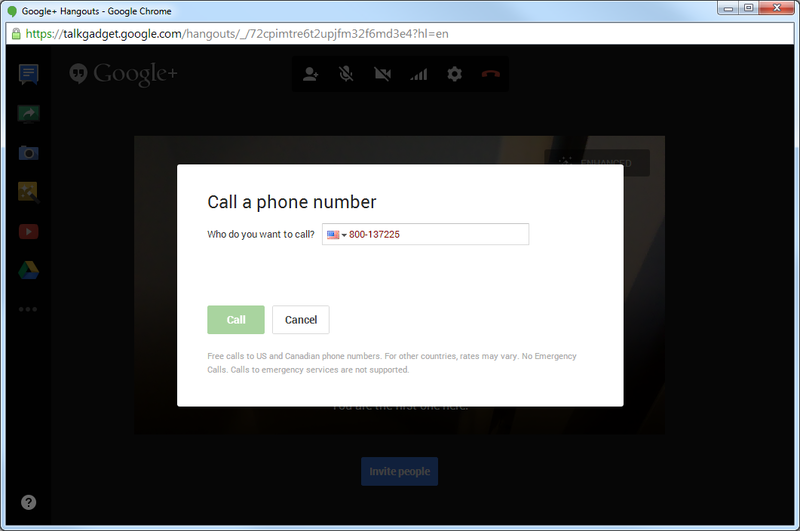 We’re excited to bring the power of Google+ Hangouts to all of our customers today - happy calling ! Last week one of our customers posted a great piece about his experiences and learnings during his first year in business. This post has a lot of valuable lessons from networking advice, costs (always more than you think), and customer behavior. So we're re-posting because sessons like these are beneficial for small businesses everywhere. Care to share any of your own tips about starting or running a small business? If you’re still new to running your business, you’re probably still trying to figure out what tools are worth investing time and money in, and which you can skip. While something like billboard advertising is probably one you don’t have to bother with, customer relationship management (CRM) software is one you should consider. In a nutshell, a small business CRM helps you better manage client relationships. If you’ve devised your own system of keeping track of contacts, such as affixing Post-It® notes to your computer screen, you know that once you have more than half a dozen customers, it gets a little trickier to recall every conversation or email you exchange with your customers. And if you’ve ever let something accidentally slip through the cracks, like following up after an important conversation, you can appreciate a better way to manage this process. While not every CRM platform includes project management features like calendars, task assignments, and email reminders, you’ll benefit from choosing one that does. Unless, that is, you have your own personal assistant who reminds you about everything...and these days, who does? If your goal as a business owner -- and let’s face it, every entrepreneur has this as a goal -- is to continually grow, you need a reliable system for developing and converting prospects into sales, and a small business CRM can play a major role in making all these business processes much easier. Let’s say you’ve been in contact with a potential lead via email. In your CRM, you can input this contact and if you think the contact has a good chance of becoming a customer then you can create an opportunity record to track the potential business. You can attach your proposal along with email correspondence and notes on every call, so you have everything that relates to that opportunity in one handy place. You can invite anyone on your team that might need to be involved in converting a prospect to a sale to view the opportunity in your online CRM, and you can add tasks to keep the opportunity moving down the sales funnel. If for some reason, this prospect doesn’t end up in a sale, you can close it and specify the reason it didn’t become a sale. This kind of highly valuable data shows a big picture analysis of why you’re losing out on sales. For example, perhaps you’ve lost out on ten sales in the past two months, and 75% of them said your product was too expensive. This is worth considering. Perhaps it might be time to lower your pricing, offer a lower-tiered version of your product or service, or even create content that illustrates the value your product provides to your customers. Early on, customer databases and CRM were a bit overly technical for the average user. But now they’re extremely small business friendly. Our own Insightly CRM platform is designed to be simple enough to figure out within minutes. We offer free videos on Insightly University and easy to read FAQs in our online knowledgebase. If you’re serious about succeeding as a business owner, make sure you’re using the right tools, like a CRM. They’re designed to help small business owners like you be more effective at successfully growing your business. Get your free account today, or try a 14 day trial of our paid plans. Would you like to get early access to new releases of Insightly’s Android app? We’ve just launched our Android beta testing program, and we’re looking for participants! 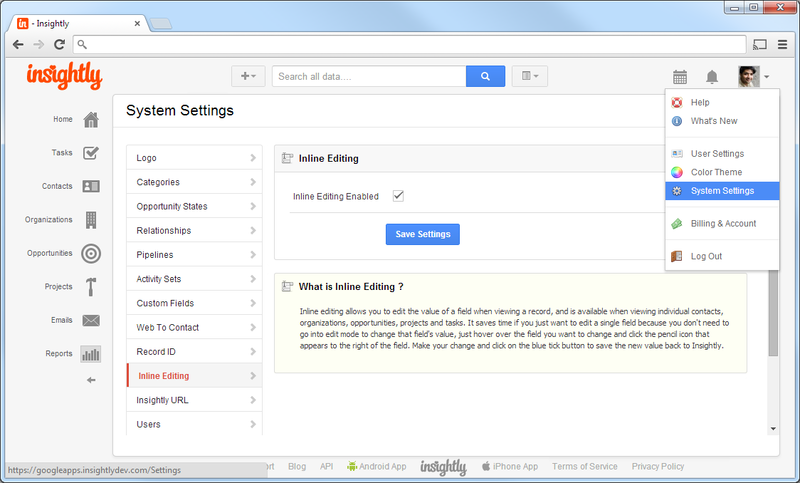 To join our beta testing program, simply request to join the Insightly Android Beta Testers community in Google+. You will be approved within 24 hours, and then will receive further instructions for installing beta builds whenever a new one is available. Ready to participate? Click here today to join the Insightly Android Beta Testers community! You may have heard that small businesses thrive as a result of implementing the right SMB CRM (Small Business Customer Relationship Management) service, but perhaps you haven’t heard WHY a great CRM makes a big difference for your business or organization. We all know that keeping customer and project management information organized is a vital key to long-term success. But how does all this apply to your small business? How can a small business CRM help you produce better results in YOUR specific field? Let’s cut the generalities and talk about your industry for a change, and how choosing the right CRM can help take your small business to the next level. When you combine equal parts bookkeeping, event planning, fundraising and contact management, your friendly neighborhood non-profit organization looks just like any other small business out there. When choosing a non-profit CRM, be sure it not only streamlines the processes of managing and connecting with volunteers, organizing teams and committees, and tracking donations (by type, amount and donor), but that it also has the flexibility to work around difficult situations (like when that big donation falls through). Additionally, always opt for an online CRM (like Insightly) that allow you to organize your contacts in different ways, so you can quickly find the best candidates to tap as board members or to organize the project management aspect of your next big fundraising event. Let’s face it: your marketing agency is made up of on-the-go, jack-of-all-trade types that generate leads, pitch and create campaigns and stories, ideate, churn out and promote content, and then some—and you probably need all of those things done “yesterday.” To keep it all together, your best option is a cloud-based CRM that integrates with your phone and email, allowing for constant collaboration and resulting in overall efficiency. You’ll also want to look for a CRM platform the team can learn to navigate in one sitting, to avoid holding them up with lengthy training sessions. From a sales or client services perspective, it’s also useful to track each interaction you’ve had with a lead or potential client, from first contact to the moment they sign the contract. 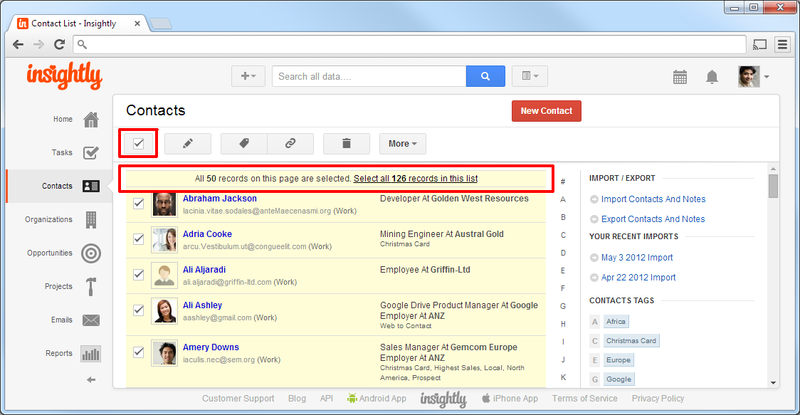 Many CRMs can also run reports, take snapshots or generate useful statistics. With this depth of data, you can track the success of campaigns or initiatives. Imagine the results-oriented media you could create and how far that would go in targeting potential clients. Don’t forget, the right CRM can even allow you to build your marketing agency brand! Your cellphone and email are up and running before you are because every email, call or free moment means potential business. The real estate industry is in constant flux. As a trusted liaison, you need to be ready for anything. At any given moment, you may need to send information to a client about a house newly on the market, negotiate a price reduction with the correct person, or collaborate with your colleague on a proposal. The right small business CRM can facilitate all of these processes. Much of your business is done via email and you may even have a block of time allocated for reaching out to potential clients. You need constant access to all your information and contacts, so make sure your real estate CRM allows for easy and customizable organization, imports data seamlessly, and doesn’t require you to hop in and out of your email all day. Whether you specialize in produce, candles, furniture or clothing, your shop was built from the ground up, and lately, you’ve really hit the ground running. You’ve made it a point to research your market and after all the expos, trade shows and markets you’ve attended, your name is out there and you’ve got lists upon lists of potential customers in the form of names and email addresses. Your ideal CRM platform will let you track orders and stages of production from start to finish. You’ll also want contact importing capabilities, as well as the ability to customize fields, including information and details such as shipping preferences and past ordering habits, adding more than just faces to names. While industry needs vary, the truth remains that to serve the most benefit, the right small business CRM platform must be integrated and intuitive. Even better if it allows you to track your progress and successes. You should never miss an opportunity to keep your staff (or yourself) posted, cultivate and nurture just the right contact, or pump out powerful statistics to let the world know just what your small business can do. Check out how small businesses from all industries use Insightly. Engagement can be the one thing that stands between a business and significant sales. Some businesses choose to engage their leads and contacts though social media networks, others use personal blogs. However, 2014 is teaching us that it isn’t so much about using a specific tool as it is using a tool that your contacts are likely using themselves. Not sure how to find out what tools they’re using or how to engage them through these tools? Keep reading to find out. The first step to properly engaging your leads and contacts is to know what it is they want to talk about. Instead of using timely surveys to find out what that is, try using a social monitoring tool like Hootsuite. A social monitoring tool identifies what your leads are saying about your business and your industry. Certain tools come with a social signal feature that alerts you each time one of your leads checks out your site, reads your emails or visits your social media pages. The information leveraged from such a valuable tool can help you to lower your marketing costs by investing in the right lead sources. 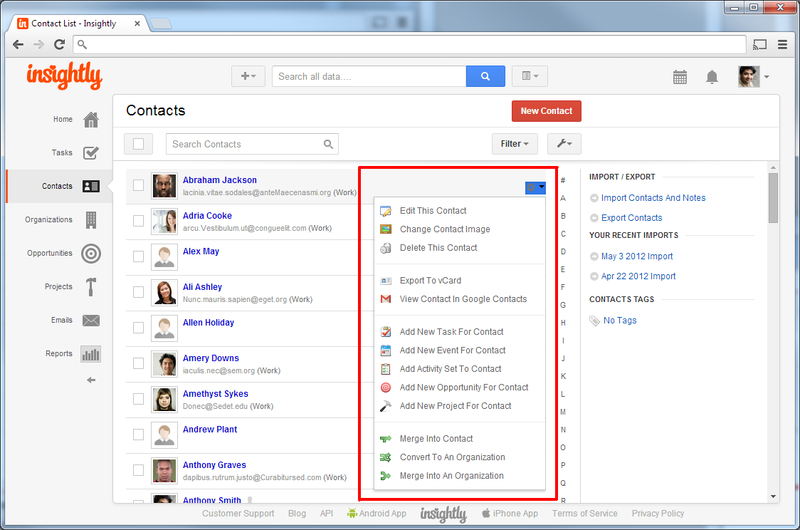 Of course, this leads to higher quality contacts and increased sales. In addition, to complement a social monitoring tool, use a CRM with social integration and you can also see where your leads and contacts frequently post. Big businesses (in particular, those in the media industry) use social login apps to increase their sign-ups, and small businesses should also use this. Social logins allow prospects to sign-up for an account or additional information by logging in with one of their social media accounts. You might notice this tool when navigating a website that requires you to create an account in order to proceed or receive special offers. The advantages of social logins are time and contact information -- it takes seconds for someone to log in using their social credentials and you can leverage all of their social media information once they sign up. The information you gather using these tools is almost as valuable as interviewing the contact personally. You’ll know their likes, what conversations they have and contact details. This data can help you create better lead nurturing content. This has been said time and time again, but some businesses just aren’t seeing the engagement and conversion rates that they were promised by using whitepapers. The problem isn’t so much the papers as it is the execution and content. Whitepapers are wonderful marketing tools as they really show that you know your stuff. However, if you send your too many whitepapers back to back, your contact won’t bother reading them and just block them as spam. Also, if you’re not aware of what kind of information your leads need, you might be sending them the wrong content. To avoid either one of these mishaps, use an online small business CRM to keep track of your contacts and leads and all of their interactions with your company. 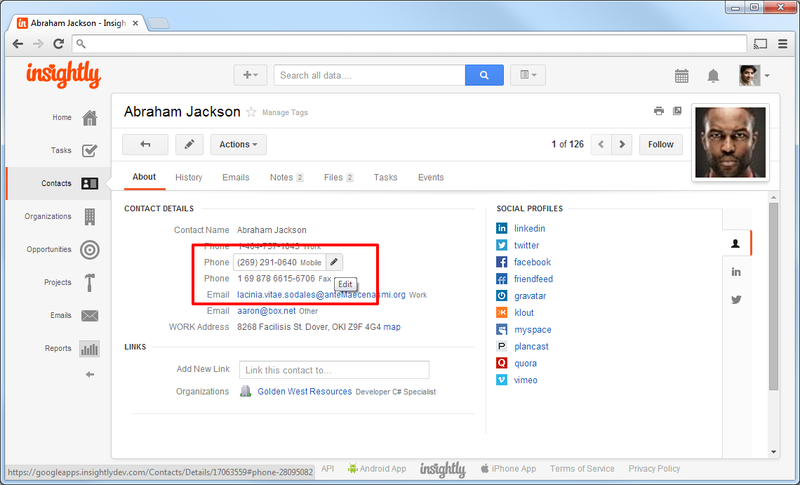 Additionally, you can use the tools listed above to leverage further data about your prospect’s interests. Once you know what it is they want to hear, create a whitepaper that addresses this. Send the whitepaper and wait about 2 weeks before sending another. Why wait for your contacts to make the first move when you can actively engage them on social media? Social media platforms such as Linkedin, Facebook and Twitter see millions of posts per day from both business and personal users, making it a potential jackpot for marketers. Not only can you mine for information on these platforms, but you can also converse with them directly. Make sure your social page is friendly by starting conversations pertaining to your industry or promotions. Invite your leads and contacts to join the conversation by including a call to action statement at the end of your posts. Once they do reply or share your post, reach out to them – and most importantly – keep the conversation going by replying back. Other users will see this and view your company as an approachable one. Growing your SMB doesn't have to be painful. There is no “secret-science” behind engaging prospects, just a few tools and tips can keep everything flowing smoothly. By following the above advice, you can not only promote better engagement with your prospects, but you’ll also gain new leads and contacts who like the way you do business. Do you have any tips to engage leads? Inbound marketing was once thought of as a fad (can you believe it! ), but now it has proven to be the single most effective method of marketing. One, because it’s very cost effective and two because it’s easy to maintain. However, in recent years marketing experts have put a huge focus on social media, with an even bigger focus on social data. We all know that social media is a very powerful medium due to the sheer volume of people using it, but the data leveraged from these platforms is priceless. While search engine analytics continue to be the ‘main’ source of data for a business’s audience, social data offers a deeper insight into each customer. What is Social Data (Social Media Analytics)? As a SMB owner, you’ve probably already opened a social media page on Google +, Facebook, LinkedIn or Twitter, but did you know that these platforms offer much more than just room to showcase your brand? These platforms gather important information (data) from each member that uses them daily. Some of this information is gained during the signup process, but the majority of their data comes from what’s leveraged during everyday usage. Every time a person ‘likes’, ‘shares’ or comments on a post, the data is saved. This means that platforms like Facebook might know more about their members than their own families do. Aside from gaining surface data and storing it, social media platforms log the times a member signs in and out of the platform and how long their average sessions are. This is valuable information for businesses with social media campaigns. Some social media platforms offer this information (but it’s limited) to businesses who have premium pages, others do not. In this situation, you’d have to use a social data tool to obtain social analytics. According to Visual.ly, the highest amount of traffic gained from implementing social media marketing just 6 to 10 hours a week was 74%, followed by a 65% fan base increase and a 61% increase in lead generation. Most businesses/marketers use social data to help them better understand their audience. Others use this data to improve their CRM or as an extension to their social CRM efforts. Still, many find that they gain more leads using social media than they did before implementing it. Overall, the main benefit of using it is increased lead generation. Platforms like Facebook, offer a paid sponsor option for businesses to utilize, which exposes their page to people in their target audience – this increases the quality of leads gained. Another great benefit to using social data is the information you get back from your current customers; this helps to attract more leads. In efforts to improve your CRM, social followers may offer feedback about your products and services on your page. This increases your brand’s trustworthiness, so leads are more likely to approach you. Customers may also offer valuable insight into how your business or products can improve. When it comes to Social Media Marketing, there is no one-size fits all approach. Your social analytics (data) may differ greatly from other businesses in your niche, so it’s always a good idea to mine your own data instead of borrowing analytics. By developing a solid SMM plan, you’ll not only gain more leads, but your company will experience faster growth and improved sales. Do you have any social media best practices? Please pass them on! As we mentioned in our 2013 wrap up post we are working with Logical Operations to deliver an Instructor Led End User Training Course. Logical Operations, a premiere training organization that helps companies and individuals maximize the learning process, will offer this one day class through its' partner training centers. The class curriculum is designed to provide users with the skills they need to be more effective using Insightly, and in turn, more successful on the job. The Insightly curriculum is currently scheduled to be available in late April/May 2014. Learn more about the upcoming class and Logical Operations.